I hate it when I have to photograph at night. I just can't ever get the colors to look right, no matter how much post editing I do. Oh well. 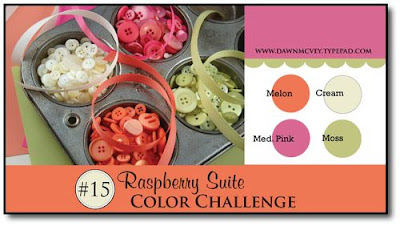 ;o) Dawn was having a Color Challenge over at My Favorite Things, and I barely made it in time. Seriously...I think it was 9:59 when I linked. Whew! The colors were Melon, Pink, Moss, and Cream. I don't have any of the PTI cardstock (note to self: buy PTI cardstock). So I used Stampin' Up! Groovy Gauva, Pixie Pink, Kiwi Kiss, and Very Vanilla. 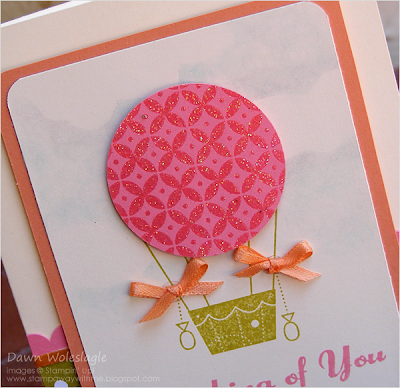 This is also a little sneak peek of the Hot Air balloon from the Sweet Centers stamp set that will be available on Sept. 1st from the Holiday Mini. And it is so much more than a stamp set...wait til you see it! Surprises! 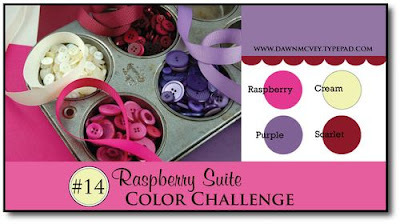 Hope you enjoy and be sure to check out all of the other fantastic entries by clicking on the Color Challenge banner. Edited to add: Now that I have a little free time I thought I should add some details about the card as well as the Supply List. I actually had a lot of fun making this one...even if it was in the 11th hour. 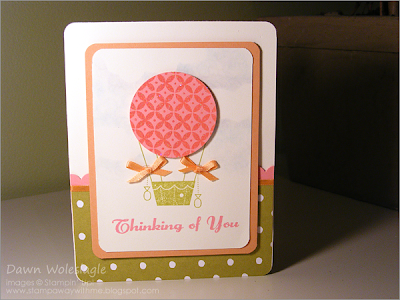 LOL For the balloon, I used Versamark to stamp a Martha Stewart background pattern on Pixie Pink cardstock and then sprinkled it with embossing glitter for some sparkle and punched it out using Stampin' Up! 's 1 3/4 inch circle punch. The fun part was adding the sky in the background. I hand cut a cloud shape out of cardstock to use as a mask. 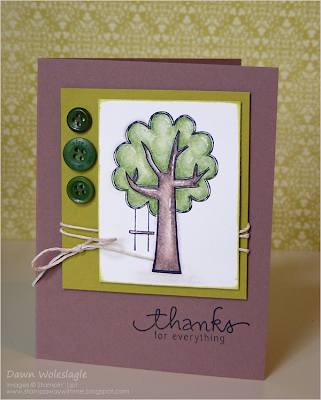 Then I used a q-tip and my Stampin' Up! pastels to lightly color in a sky moving in circular motion. I moved the "mask" two or three times as I colored it in. So easy, and a beautiful subtle effect IRL. The stamp has cute little bows on the basket strings, so I added real ribbon bows for pop. 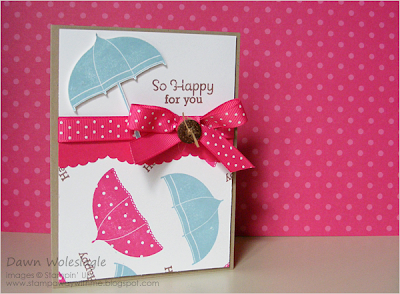 To pull it together, I repeated the scallops and polka dots from the stamp with the background paper and border. Here's a better, close up view. The Giving Tree just happens to be my husband's favorite childhood book. So when I saw it, I just had to get it as a present for him to share with our boys. This card was inspired by the book. That poor tree is finally recieving a little "thank you". I got to play with my Prisma color pencils and mineral spirits. I rarely do the whole coloring in thing, but rather liked how this one turned out. That swing looks so inviting, doesn't it? Enjoy, and thanks for looking! Yeah, I did it! I am so excited, I FINALLY figured out how to stamp with PTI's clear stamps! OK, so some of you are scratching your heads, going huh? What's the problem, I don't get it? But if I have some fellow acrylic challenged stampers out there like me, there is a funny story below for you and a tip. I have had the Scattered Showers set for about a month now, and I could not for the life of me get a solid, crisp image. At first I thought it was surely the ink. I tried pigment ink, stayzon, chalk ink. Nope, none made a difference. 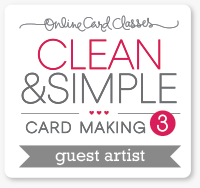 So I took a look at Nichole's blog and read her Acrylic Stamps 101 post. Oh.....OK, I have to "condition" them! Ah ha, that's it! So I get out my trusty white artist eraser and ever so gently rub over the stamp. I'm so excited. I'm finally going to get to use this fantastic set! I stamp my image, and....UGH! No, I'm sure this is not what it's supposed to look like. Just to make sure, I go and check out Dawn McVey's examples, and her's are sooo flawless! So on to tip #2, I wash it in warm soapy water. Of course, that's it! Noooow it's going to work. I ink it up and stamp and....NOPE! OK, now I'm thoroughly disgusted and put the set aside, as I am sure it has to be operator error at this point. Like so many of you this was a streeeetch for me. I would have to say, out of all of the colors in the world...purple is my least favorite. But alas, the colors were raspberry, plum, cream, and scarlet. Be sure and check out the other fabulous entries by clicking on the image above. Have a wonderful night, I know I will, it's release night over at Papertrey Ink! I've recieved my 1st award! Thank you, thank you. *sniff* I just don't know what to say. First, I'd like to thank the academy, god, and.... OK seriously, I would like to give a great big cyber-hug to Rose. I'm flattered as she has some mad creative skills. If you've never visited her blog, you should, she's a great creative inspiration. Thank the person that nominated you for this award. 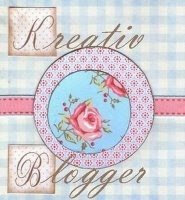 Copy logo and place it on your blog. Link the person's blog that nominated you for this award. Post a link to the 7 you nominated. Leave a comment on each blog to let them know they are nominated. Seven things you might find interesting about me. I am a Design and Usability Analyst by day, which is a fancy way of saying a graphic artist who focuses on user friendly design for web design. I started crafting and painting when I was 9, helping my mom sew those old victorian bunnies made out of burlap. I actually never wanted to have children, but now can't imagine my life without them. I not so secretly want to be a stay at home mom. I LOVE cheesecake, but only allow myself to have it once a year, on my birthday! I am horrible at mailing out cards. I am a military brat and attended 11 different schools growing up. ...when the bag is this cute! I had so much fun decorating this gift bag. I scored a pack of 13 of these plain kraft gift bags from Michaels for under 5 dollars. I thought they would make the perfect 3d item for Stamp Club this past weekend. I started by using the Stampin' Up! 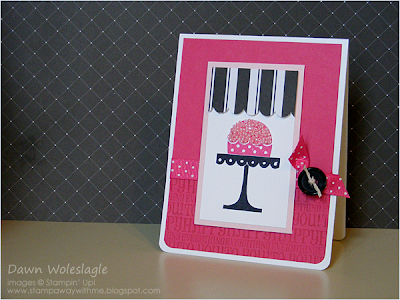 Circle Circus stamp set, along with the Stamp-a-majig, to create two different background papers. I then adhered them together, wrapped with ribbon, and used dimensionals to adhere to the front of the bag. To finish it off, I made a matching little gift tag to hang from the handle. I added the buttons as an after thought, but am now having second thoughts about them. What do you think, should they go? I love, love, love this set. It is so much fun, and it really is versatile. 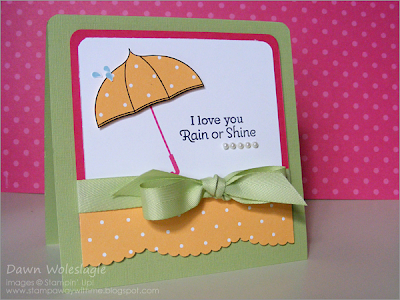 Here are two cards both using Stampin' Up! 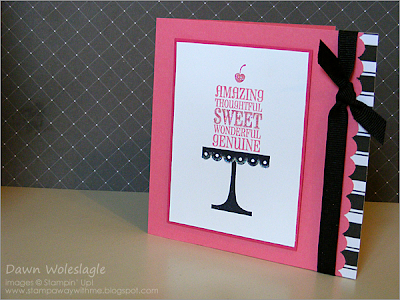 's On A Pedestal stamp set, and both using the same colors and paper; pink, black, and white. I've starting making 2 cards at a time now, why not? I've already got the supplies out, right? I tried to make it look like a little bakery shop window with a black stripe awning. What do you think? Here I used the "Happy Everying To You!" sentiment to create a background on the lower card base. Then I added some some pink glass beads to emulate some frosting, and finished it off with a little Melon Mambo ribbon and a button (extra buttons from clothing, nothing special). This one's a little more simple, but still just as cute if you ask me. I love how the text looks like a layered cake (in hindsight, I'm thinking that I should have made the word "Sweet" black), and that little cherry on top is the finishing touch. I really like that black and white paper. I snagged it from my mom, I believe it is by Me & My Big Ideas. 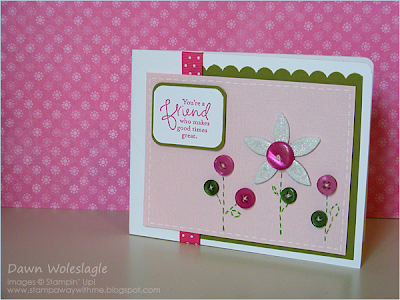 Inspiration Challenge #1 Glitter and Chipboard, Oh My! 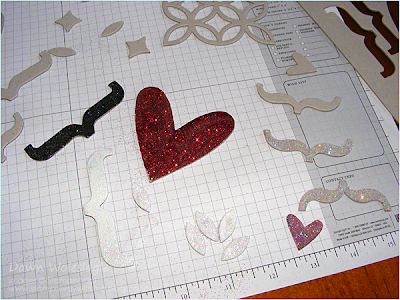 I took some time to create my own glittery chipboard embellishments using my Big Shot. 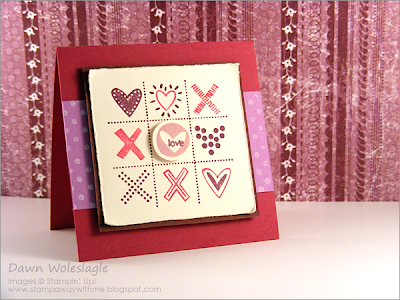 The little cutie above uses some left over pieces from the Lattice Sizzix Die from Stampin' Up!. I just LOVE this die. I have done so much with it already...but I have submitted some for pub, so if I don't hear something in a week or so, I will post them as well. Here is a shot of some of the pieces I made today. OK, now it's your turn. Let's see your inspiration with chipboard! 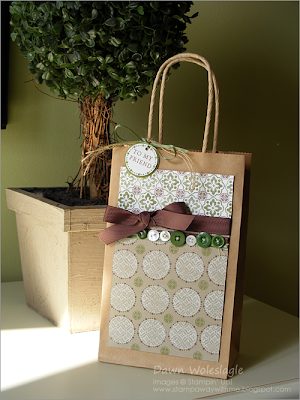 Here's the details: Create a card, scrapbook page, altered item, or anything using chipboard. It can be totally unique or something tried and true. I will keep Mr. Linky opened until ETA: 8pm Friday August 15th. Have fun and I hope you decide to play along!